What is your vision of flowers in your garden? Do you ever reach the beautiful rainbow of colors you imagine? The joy of planning a garden and working the soil is what makes us gardeners. So let's get the most out of our work, with garden plans and flower garden ideas based on the natural traits of all types of annual and perennials. These are ideas to keep in mind when laying out your garden beds and choosing plants. Design your garden plans with your flowers' natural blooming in mind. Plan well, and the result is a flower garden that blooms from spring to frost in vibrant color. Be sure to check your planting zones, so your flower garden plans include the best flowers for your climate. Here are some basic flower gardening tips to think about. First, let's look at the different types of flowers. Consider how long you want your flowers to survive in the garden. Your flower garden ideas will unfold from there! Annuals last one season and die out. This means these flowers have to be replanted every year. The advantage here is you can always change your garden plans the next year. Annual blooms provide a glorious array of color during their blooming season... no garden is complete without them! Use these blooms in gardens, and as edgings and borders. Mixing annual flowers in among perennials and bulbs fills the gaps in a garden while it extends the flowering time. Annuals are excellent flowers for hanging baskets and container gardening, too. Perennial flowers come back year after year. The advantage here is you never need to replant them. However, short of transplanting them all, you are "locked-in" to your original garden design. First, choose perennial flowers based on their tolerance of sun or shade. Aim your garden plans towards getting different perennials to bloom at a certain time and place in your garden. Also, choose the height of flowers for each spot in your garden... from low creepers to tall flowers reaching 6 to 10 feet. Flower bulbs come back each year, after being dormant over winter months. Many bulbs are hardy and reliable, meaning you can "forget" about them... and they'll present themselves sure enough every spring. 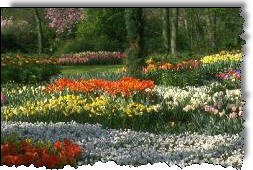 Just like perennials, you can plant bulbs according to flowering times for a constant array of color. For a garden that blooms all season, plant a number of bulb types with succeeding flowering times. 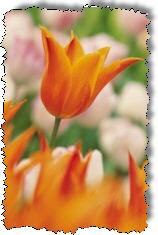 Intersperse flower bulbs into several types of blooms, ground covers, shrubs, and along sidewalks or garden paths. Be creative and plant them in patterns! A rose garden is the crowning jewel for most home gardeners. While no garden is complete without roses, a rose garden is complete in itself. No other flower has passed the tests of time and preference with such grace. A formal rose garden is breathtaking. A country home adorned by roses has incredible charm. Is there an art to growing a rose garden? Sure there is. But we make it easy, and show you step-by-step everything you'll ever need to know. 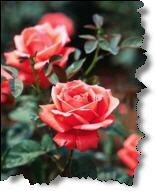 You'll be surprised how fun roses can be when you learn rose gardening from us with our Easy Book series, Easy Rose Gardening. Get our FREE practical guide to dealing with pests, diseases and disorders that commonly affect lawns, vegetables, trees and garden flowers. Sign up for 101 Gardening Tips: A - Z of Pests, Diseases and Disorders. Completely FREE! For more great pointers about types of flowers such as annuals and perennials, plus more flower gardening tips, check out the facts and suggestions from our flower guide.